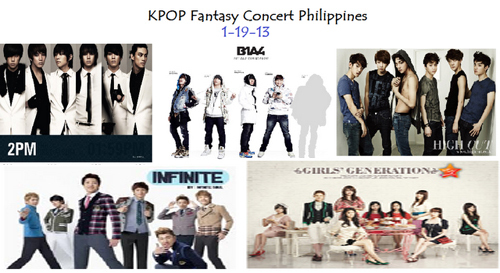 I posted here few weeks ago the topic 'KPop Fantasy Concert Live in Manila' on January 19 of the coming year 2013. This is to give more update about the concert tour of different KPop artists that is set to perform in our country. This post is to update KPop Filipino fans on how much will the concert tickets cost and so to help them know who among the many KPop artists have already confirm to perform at SM Mall of Asia Arena next year. If you have more questions to ask about the tickets, you may contact smtickets via this number - 470-2222. For more information about the upcoming concert of your favorite Korean Pop Stars, you may bookmark this page or visit this website more often. I'll update this post as soon as an available information is given. Thank you!! Comments or suggestions about "KPop Fantasy Concert 2013 in the Philippines Ticket Prices and Updates" is important to us, you may share it by using the comment box below.